Of course it’s one thing to make compassion an intention in our lives and quite another to live it. Oh, I try, I honestly do, to be as good and decent a person as I can—I’ve been consciously working on myself, on my connection to the Divine, since I was in high school—but the truth is, for all my work, for all my striving, I’m regularly astounded by my ability to say or do spectacularly stupid or hurtful things. It's William Shatner's 80th birthday. (How did he get so old while the rest of us haven't aged?) A few years back I wrote, at length, on my old Amazon blog about the reasons why I'm an unrepentant, unapologetic Shatnerd—the essay seems to have vanished into cyberspace, so I may re-post it here at some point—but, really, it can all be summed up in two little words: Denny Crane. Of course I love Captain Kirk and the Priceline guy, the unhinged airline passenger who flew through The Twilight Zone, Third Rock's Big Giant Head and the Shakespearean prosecutor of The Andersonville Trial (among many others), but Shatner's portrayal of Boston Legal's legendary lawyer is the role that folded all his personas into one larger-than-life—and yet heartbreakingly human—package. So, in celebration of Shatner entering his ninth decade, here's a little taste of the inimitable Denny Crane. Over at Comic Book Resources, they've posted the first six pages of my very first published comic book story, a Weird War Tales piece called "The Blood Boat." WWT—which was captained by a way-too-young editor named Paul Levitz—was just what the title implied: war stories infused with horror elements. This particular story was—to put it in Hollywood parlance—PT 109 meets Dracula. 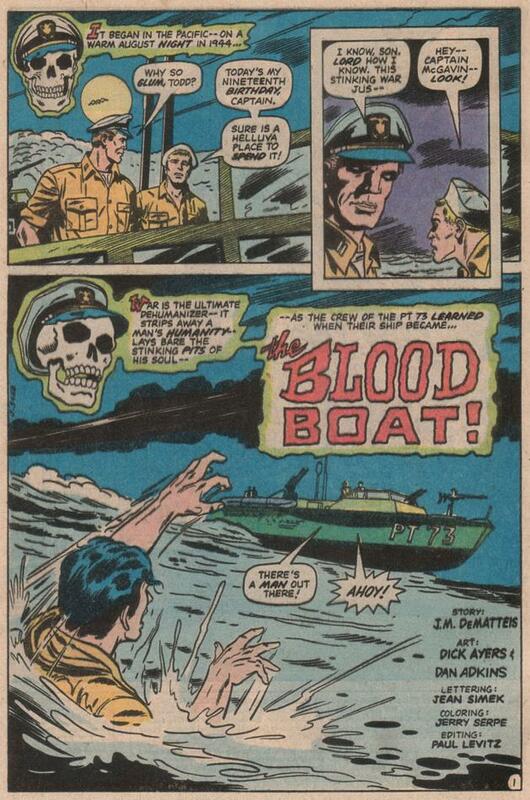 Although it was the first of my comics stories to see print, "Blood Boat" wasn't the first one I sold. That honor goes to a House of Mystery story with an almost unforgivable title: "The Lady Killer Craves Blood." (Yes, it's another vampire story. I wrote lots of them in those days—for the astounding rate of thirteen dollars a page.) I sold "Lady Killer" in December of 1977, just as I was turning twenty-four, and, as I've said elsewhere, working on DC's horror anthologies (actually, they didn't use the word horror back then, they called them "mystery books") was a fantastic way to learn my craft. (It helped that I had wonderful teachers like Paul, Jack Harris and Len Wein—who became a mentor to me, encouraging and developing my talent in a way no one else had—showing me the ropes.) Those anthologies were the vaudeville of comics: so under-the-radar of the average super-hero reader that I never had to worry about my work being noticed, or savaged, by the fan press. It was a safe place to try out material, fail spectacularly, and get up again, wiser for the experience. And a thrilling experience it was: I didn't care about the money, I didn't even care if anyone was reading the stories, I was working in comics, I was part of the business, and that was what mattered. A final note about "The Blood Boat": I actually sold that story three times, taking the basic premise and re-working it into a science fiction story ("Howl" in Mystery in Space #112) and again for a Joseph Conrad-lite saga of the high seas ("The Seas Run Red" in House of Mystery #291). Hey, at thirteen bucks a page, you did what you had to to survive! The first page of "The Blood Boat" is below. Hop on over to CBR for the rest.